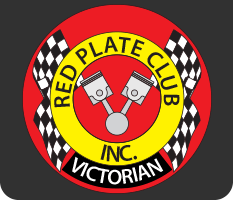 The Club Permit Scheme, or colloquially known as "Red plates" is a form of permit relatively new to Victoria. To the critics of the Red Plate Club, the colour of the number plates is more a burnt Sienna. We could have named it the Burnt Sienna Plate Club but Red was easier. VicRoads does not consider this to be full registration but a "Registration Permit" of an unregistered vehicle recognised by VicRoads to make limited use of historic vehicles older than 25 years on the road network. The VicRoads fee is made up mostly of the TAC insurance. If extrapolated out over 365 days it can be seen to be fair value for the lesser period of 45 or 90 days. Because it is a permit, probationary drivers can drive V8 cars. Some media have tried to beat this up as a terrible situation where hoon's drive V8's. We haven't seen this at all. It is more likely the so-called hoons don't have registered cars or even a drivers licence. There is no stamp duty applicable to CPS vehicles on the transfer of ownership. This can be a substantial saving. Insurance premiums are generally much cheaper. We are seeing greater values for cars once they have gone through the checks and balances of the CPS. Each state in Australia has its own system and they are all different. Western Australia is the only state that does not recognise the Victorian Club Permit Scheme at this time. They seem to think they are a separate country. Tasmania has a system with historic vehicles where a "Club" membership is not required. Their historic registration fees are about half full registration. Across Australia the CPS systems appear adhoc. There are advantages and disadvantages to each state but what we have in Victoria is broadly considered the benchmark on how it should be done. No doubt at some stage the politicians will change it again. Please see the information below regarding VicRoads Roadworthy Policy and their photo requirements, modified vehicle restrictions and requirements regarding providing a VASS Engineers Certificate and some tips for completing your logbook. Old men with nothing better to do spread rumours the Club Permit Scheme will be shut down or that a lot of clubs are about to be closed or that this 'Red Plate Club' is about to be shut down. This is misinformation spread by ignorant old luddites. The police can't shut a club down. VicRoads have a committee that focuses on auditing the 1,000 existing clubs and they shut down a few but it is a slow process. It is easy to change clubs and most times no roadworthy is required. If you put your car on club plates it will be fine, for many years to come and you save a lot of money. Vehicles going onto the CPS must have a current roadworthy certificate. A vehicle currently on red plates that has been purchased by a new owner must have a roadworthy certificate to enable it to be eligible for the CPS in the new owner's name. The only exception to a roadworthy is when the owner changes clubs, then the roadworthy is at the discretion of the club. It may be the previous club has folded and the vehicle is of a dubious roadworthy condition. The new club may request a roadworthy to settle any disputes. We prefer cars that can't be personally scrutineered to have a roadworthy. If not the club scrutineer will personally scrutineer the vehicle. When the completed roadworthy is in your hands we swing into action as the details from that roadworthy must be entered on the VicRoads application forms. The first form is a "Club Permit Application." The 2nd is a "Vehicle Eligibility Standards Declaration for Club Permit Vehicles." The secretary will complete these forms and express post them to the owner along with a letter of current club membership. Just because you have a roadworthy doesn't mean the car complies with VSI 33. If the car has been modified beyond VSI 33 then a VASS engineers certificate may be required. If you have a 5.7 litre V8 in your fully registered Morris Minor for the past 20 years it may pass a roadworthy but you will need an engineers certificate to put it on "Modified" plates. Make yourself aware of the contents of the VSI 33 document. A vehicle built prior to 1949 may be scrutineered by an approved club official. We charge $200 which is more than a the usual roadworthy fee as we prefer you get an roadworthy. The full scrutineering on an old vehicle is actually a bit involved and takes a couple of hours. Trucks, buses and heavy vehicles are different again. The EPA have put out a "Technical guidelines for air and noise emission requirements for modified in-service vehicles." A link to that document and their web site is provided. VicRoads require clubs to maintain specific photos of vehicles. If requested we are required to produce all photos and documents as part of an audit. One of the requirements is that each picture is dated. This is usually done with the camera settings but we can obtain the date etc from a digital signature within the file. In most casses we can scrutineer vehicles from photgraphs as long as they are of sufficient quality. These photos are for a VicRoads officer who has no sense of humor, not for the cover of a car magazine, so please keep it simple, straight on and not blurry. VIN or Vehicle Identification Number tag should be 17 or 14 digits long. Chassis number. This can be any sequence of numbers & letters stamped into the chassis. Inside the cabin preferably on the driver's side. Proof of ownership or purchase such as a receipt or previous registration papers. When taking pictures of your vehicle put some effort into it. In years to come those pictures may be cherished by someone that thinks they are important even if you don't. Take the car out of the garage. Find a nice location with plenty of room and good light. Take good pictures, directly in front, directly from the sides and from the rear. If your car is stolen these pics could be of assistance. After all the pictures are satisfactorily received by the secretary the appropriate forms can be prepared then posted to your address. VicRoads require original documents. The owner or an authorised representative can take the appropriate paperwork to a VicRoads office where new red plates and a log book can be issued immediately if they are in stock. VicRoads allow applications by the post with a cheque but we don't recommend this. A proof of ownership of the vehicle document, for example, a receipt or previous registration papers in your name. Documented evidence is essential. The green copy of the roadworthy certificate provided by the mechanic. An original completed "Vehicle Eligibility Standards Declaration for Club Permit Vehicles." completed and signed by the Victorian Red Plate Club scrutineer. The details on the Roadworthy Certificate must be included on this form. A letter from the Victorian Red Plate Club confirming that you are a current member of the club. If all the planets are aligned, all the boxes have been correctly completed and the VicRoads receptionist is not having a bad day, you may get your important RED PLATES immediately. About 5% don't succeed on their first attempt, for a multitude of reasons. Don't give up, try again. Important Information: The official looking form that is received from VicRoads has 2 stickers. The first sticker, on the top right hand corner, is obvious and looks like the traditional registration sticker that sticks on the corner of the windscreen. The second sticker is not immediately obvious. It is on the top left corner of the VicRoads form. This sticker goes on the inside front cover of the new Club Permit Logbook. All these pictures are important as it confirms the registration of the vehicle and the correct expiry date on the label. This is actually incorrect about 5% of the time. We have seen incorrect expiry dates on labels, incorrect numbers on labels, "Modified" plates issued to "Historic" vehicles. VicRoads is a huge organisation with 2,700 employees that deal with 4.5 million registrations a year. When dealing with VicRoads one must possess the patience of a Buddhist monk, as if travelling on a long journey.